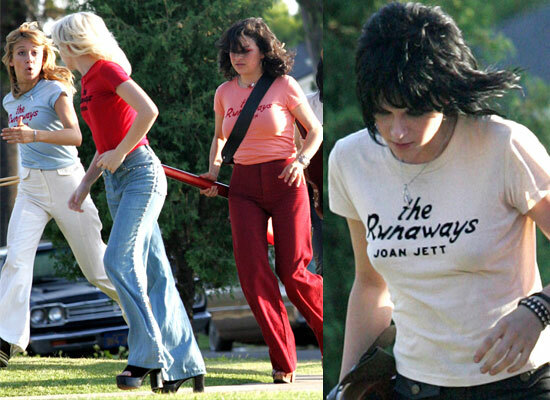 If you’re a new or recent fan of The Runaways like I am, then you’ve probably been scavenging on the net for Runaways music, anything about The Runaways movie, Cherie Currie‘s new book Neon Angel, and last but not least – Runaways T-shirts. While it may be difficult to come by Runaways clothes worn by Kristen Stewart and Dakota Fanning in the movie, you can get your own Runaways T-shirts elsewhere. I love that The Runaways movie has given the band new life, and I think it’s awesome that youth and people who didn’t know them get to discover them now for the first time. You may not have grown up listening to The Runaways or picked up a Runaways t-shirt at one of their live gigs, but you can definitely get Runaways apparel elsewhere to enjoy and show support for the band. Runaways Tee in red – exclusive to Urban Outfitters. It is being sold for $25.00 in Vancouver, but on the US Urban Outfitters website you can order it for $14.99 USD.